Any resemblance of the villain of this story to a certain presidential candidate is just a coincidence. A young man’s friend has gone missing. Holmes and Watson go with him to Birmingham to help look for him. What they find is horrifying. Two more bodies of young men turn up in London. All of the victims are tied to Cambridge University. All are also tied to the financial sector of the City and to one of the greatest fraud ever visited upon the citizens of England. 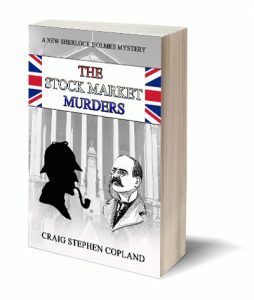 The story is based on the true story of James Whitaker Wright and is inspired by the original Sherlock Holmes story, The Stock Broker’s Clerk.